photo: Steve Porter (left), Noel Sloan, and Kenny Broad traverse the Metro in San Agustin in high waters. Photo by Wes Skiles. After the Peña Colorada Expedition in '84 Dr. Bill Stone set about developing the CIS Lunar rebreather, so that he could mount an expedition to the other end of the Huautla system. This expedition had the primary goal to dive the main downstream sump. The shortest route to this sump was (and still is) via the Sotano San Agustin entrance. It took ten years of development and training, before the expedition could finally be launched in 1994. It was probably the most hi-tech and ambitious cave exploration project yet attempted. With a team of 44 cavers and divers the spent three months in the field. The team used the newly developed rebreathers to crack sump 1, which proved to be 430 meters long to a small airbell, followed by another sump of 170 metres length. The expedition was to be, this success was marred by the death of cave diver Ian Rolland during the exploration. After a 6 day body recovery exercise the exploration resumed and some weeks later Dr. Bill Stone and Barbara am Ende dived through both the sumps and established camp 6 in the new section of cave. They spent 6 days exploring and mapping the new cave, finding a total of 3.3 kilometers of new passage. They were halted at another sump which they called - sump 9, aka "The Mother of all Sumps"! The survey data collected showed that the gap to the Cueva de la Pena Colorada was close to 4 kilometres. Sump 9, a point that may be considered the most remote yet reached inside the Earth. 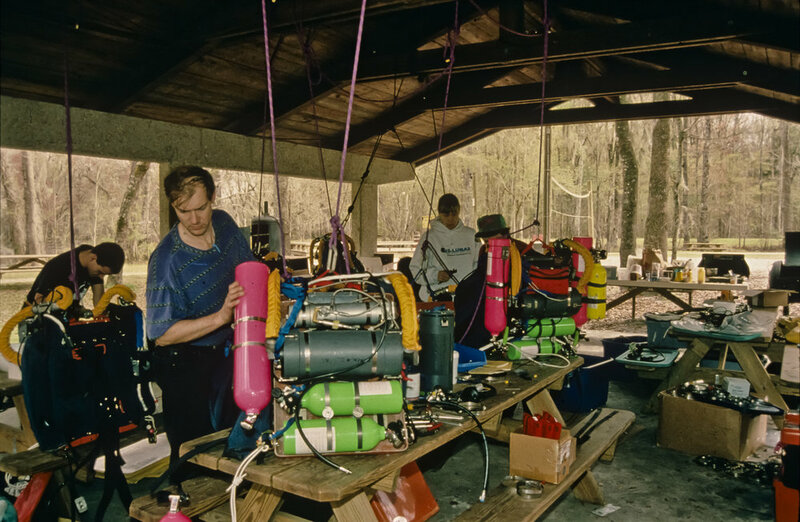 Ian Rolland, Noel Sloan, and Barbara am Ende (left to right) assemble Mk4 rebreathers at the Ginnie Springs pavilion near Devil's Eye spring. Photo by U.S. Deep Caving Team/Bill Stone. 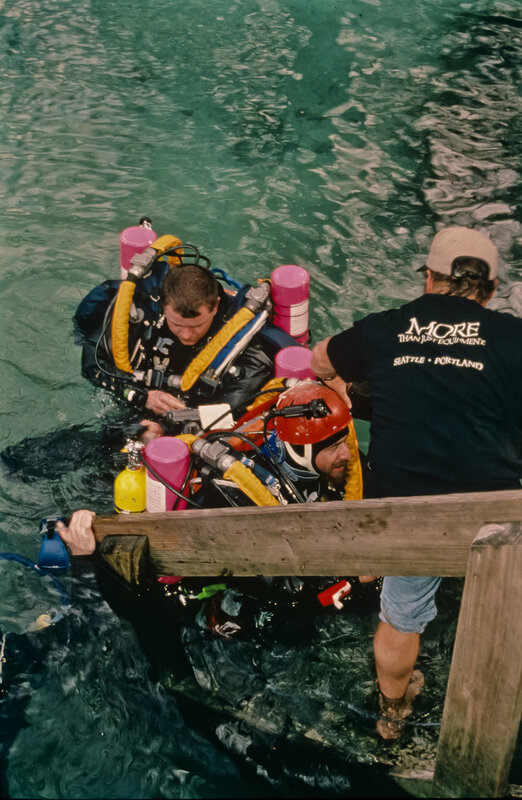 Steve Porter and Ian Rolland check out the final "stack" assembly of Porter's rig at Ginnie Springs. Photo by U. S. Deep Caving Team/Bill Stone. Barbara am Ende gears up for a rehearsal dive in Devil's Eye. Photo by U. S. Deep Caving Team/Bill Stone. Noel Sloan discusses a dive plan with Ian Rolland and Kenny Broad (back to camera) on the deck at Devil's Eye spring. Photo by U. S. Deep Caving Team/Bill Stone. Rolland (top) and Broad are greeted by Wes Skiles following a two hour dive in Devil's Eye Spring. Photo by U. S. Deep Caving Team/Bill Stone. In San Antonio, Texas, at Bill Steele's house, the east and west contingents of the team converged for two days of final packing. Photo by U. S. Deep Caving Team/Bill Stone. Jim Brown during the loading of the 2-ton van at Bill Steele's. Photo by U. S. Deep Caving Team/Bill Stone. The rolling top of the Huautla Plateau is laid out in a vast panorama in this photo taken from the top of the Nanta ridge, only a few meters above the highest known entrance to Sistema Huautla. Photo by U. S. Deep Caving Team/Bill Stone. 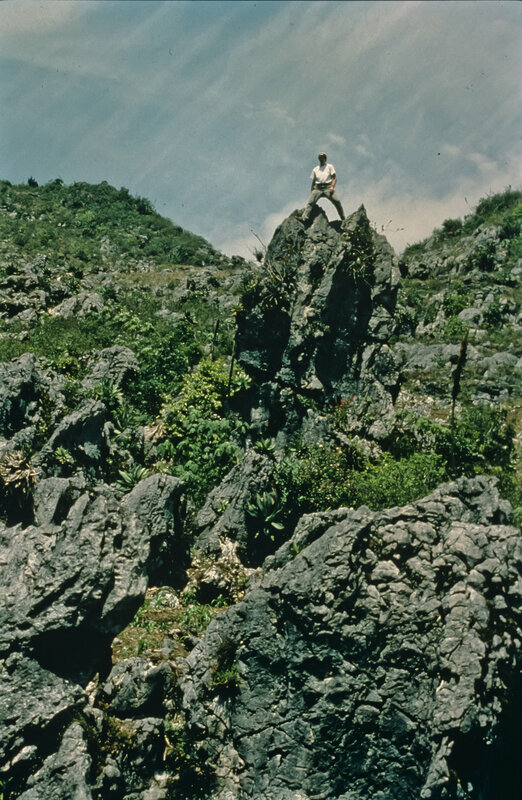 Bill Stone stands atop a spectacular karst pinnacle, one of many in the sinkholes between basecamp at the village of San Agustin Zaragoza and the southern rim of the Huautla Plateau. Photo by U. S. Deep Caving Team/Bill Stone. The team arrived at the village of San Agustin Zaragoza on March 1, 1994. Photo by U. S. Deep Caving Team/Bill Stone. The immense San Agustin sinkhole, surrounded by freshly planted fields, spreads westward towards the town of San Andres Hidalgo, visible on the upper ridge three kilometers distant. Photo by U. S. Deep Caving Team/Bill Stone. 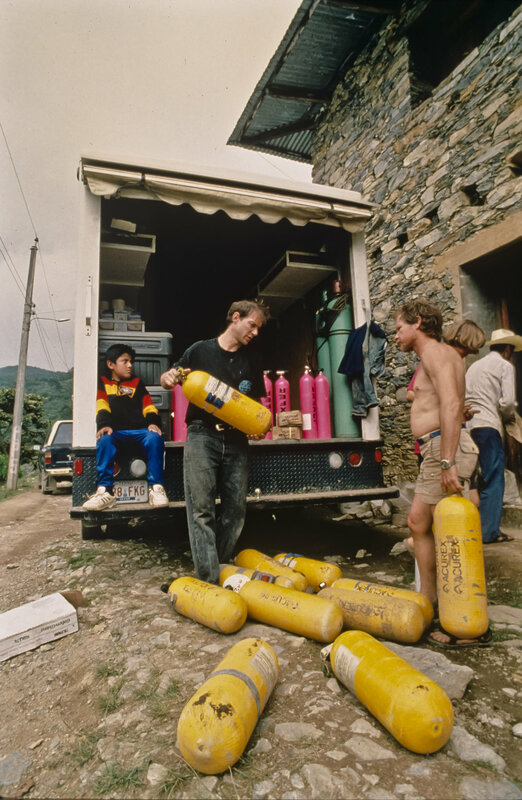 Arrival: Noel Sloan and Don Broussard unload dive cylinders at the house of Epifanio Villega. Photo by U. S. Deep Caving Team/Bill Stone. 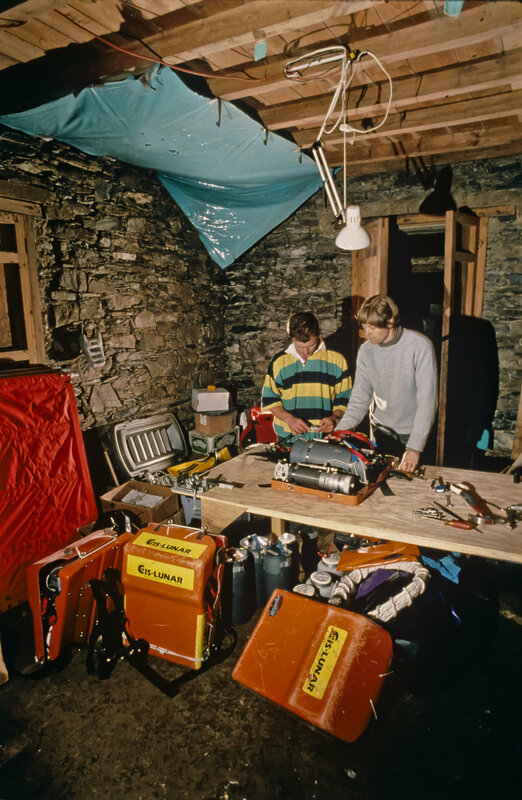 Gear prep for the first push on the San Agustin sump: Ian Rolland and Barbara am Ende prepare two Mk4 backpacks in the gear depot. Photo by U. S. Deep Caving Team/Bill Stone. Jim Brown and Noel Sloan check out the gas recharging systems in the gear depot. Photo by U. S. Deep Caving Team/Bill Stone. Barbara am Ende writes in her log on the second floor of Feliberto's house. Photo by U. S. Deep Caving Team/Bill Stone. Laundry day for Barbara am Ende at Olivia Pereda's wash board. Photo by U. S. Deep Caving Team/Bill Stone. Typical mess hall scene in early March of 1994. Photo by U. S. Deep Caving Team/Bill Stone. "Reducing perfectly good freeze dried food to dust" is Barbara am Ende's job, as she uses a "Salad Shooter" to aid in compressing food for the underground camps into Nalgene bottles. Photo by U. S. Deep Caving Team/Bill Stone. Bill Stone makes his way up the caver trail from the entrance of the Sotano de San Agustin to basecamp. Photo by U. S. Deep Caving Team/Wes Skiles. Like a spider dangling from a thread, Noel Sloan drops into the entrance shaft of the Sotano de San Agustin. Photo by U. S. Deep Caving Team/Wes Skiles. The next three slides are a progression leading further down the twin 90m entrance shafts. This slide shows Noell Sloan descending the first pitch. Photo by U. S. Deep Caving Team/Wes Skiles. Steve Porter begins a descent of the 90m "slip and slide" drop, a steeply sloping, polished sluice way which is slickened by the spray from a small waterfall which drops in from a fissure in the roof 60m overhead. Photo by U. S. Deep Caving Team/Wes Skiles. Jim Brown completes the descent of the "slip and slide" pitch. At 120m vertically below the surface the last bit of daylight is visible before beginning the long trip down. Photo by U. S. Deep Caving Team/Wes Skiles. Shortly beyond the entrance shaft a new passage - the Fool's Day Extension, discovered by Mark Minton and Bill Steele in 1988 - leads to a series of constrictions. Photo by U. S. Deep Caving Team/Wes Skiles. Beyond the second constriction the Fool's Day Extension opens up into comfortable walking passage sporting some of the few formations in the upper portion of San Agustin. Photo by U. S. Deep Caving Team/Wes Skiles. Porter and Sloan begin the 70m long "sand crawl" in upper San Agustin. Photo by U. S. Deep Caving Team/Wes Skiles. Beyond the Sand Crawl the Fool's Day Extension opens into a steeply descending canyon with some 23 vertical pitches separated by brief sections of flat walking passage. Photo by U. S. Deep Caving Team/Wes Skiles. Edging out over the abyss, Steve Porter begins a descent of "The 100m Shaft", first in a series of deep pitches which descend more than 300m with very little horizontal offset. Photo by U. S. Deep Caving Team/Wes Skiles. Noel Sloan descends the first pitch of the 100m Shaft. Photo by U. S. Deep Caving Team/Wes Skiles. Barbara am Ende (top) and Bill Stone descend the second and third segments of the 100m Shaft. Photo by U. S. Deep Caving Team/Wes Skiles. Sloan and Porter make their way along the Upper Gorge at a depth of 700m. Photo by U. S. Deep Caving Team/Wes Skiles. 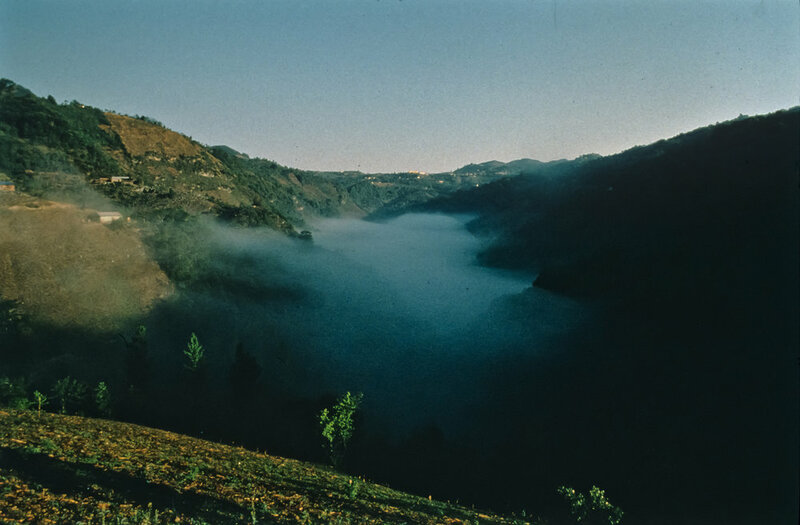 The National Geographic caption for this slide read "Torrent from a freak April storm erupts into the Upper Gorge, below which seven team members had camped. Getting his grip with rubberized gloves, Noel Sloan fights thundering white water six feet above normal". Photo by U. S. Deep Caving Team/Wes Skiles. 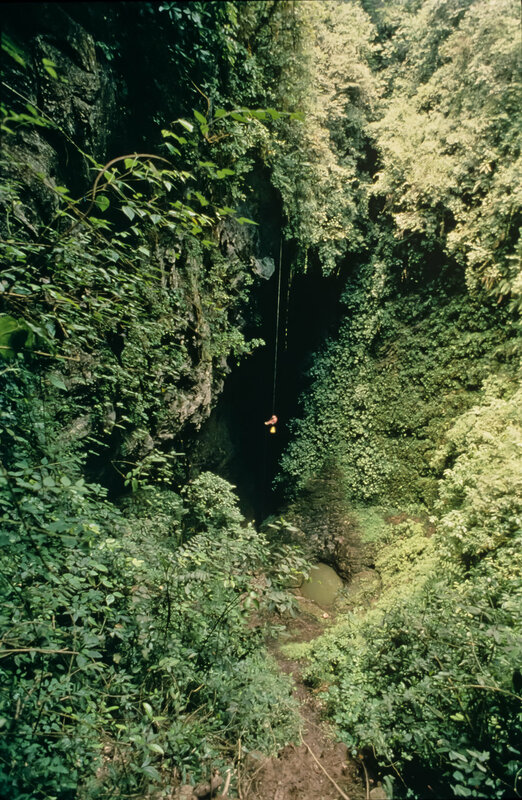 A string of cavers travels upstream from Camp 3 in "The Metro" at 760m in San Agustin. Photo by U. S. Deep Caving Team/Wes Skiles. Kenny Broad makes another wide step across the Metro junction with the Upper Gorge during more peaceful times, on March 26th. Photo by U. S. Deep Caving Team/Bill Stone. 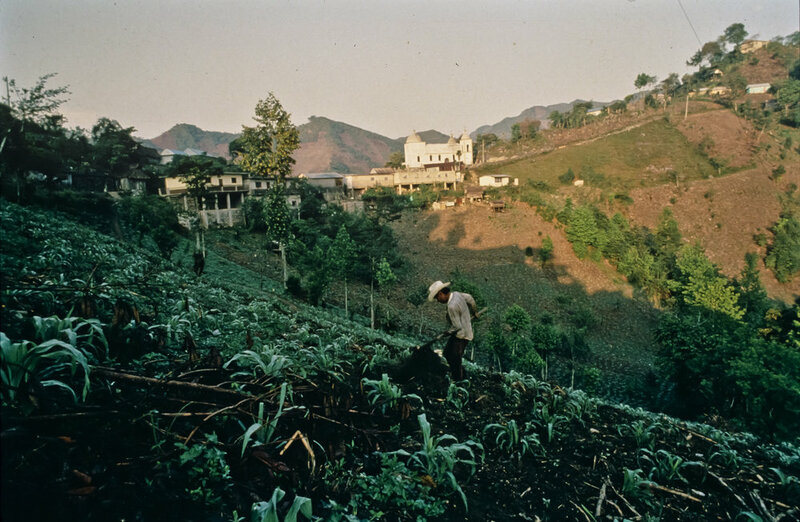 Lead photo for the National Geographic story, September 1995 issue. 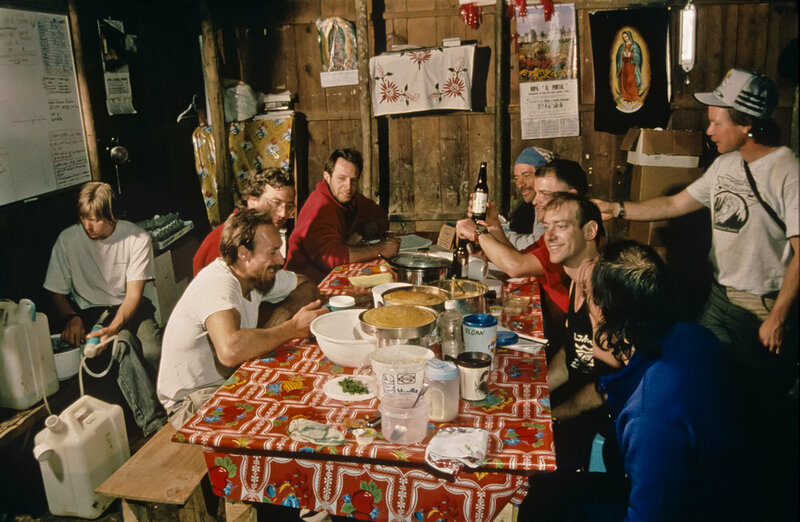 The caption read "Caught in a raging runoff that fell as rain 2,500 feet [760m] above them, explorers struggle for balance within the Huautla cave system. Photo by U. S. Deep Caving Team/Wes Skiles. Kenny Broad fights his way through the Upper Gorge on a supply run for Camp 3. Photo by U. S. Deep Caving Team/Bill Stone. Stone, B., am Ende, B., Paulsen, M., 2002, Beyond the Deep: The Deadly Descent into the World's Most Treacherous Cave, Grand Central Publishing.